Sooner or later, anyone who lives in Sicily, as well as many visitors, becomes enamored with the ceramics made here. There are many types, but one of the primary centers for production is Caltagirone, only about 40 miles from Sigonella. The hand-painted ceramics are primarily in blue and gold, and the most common motifs are lemons, sunflowers, pomegranates, olives, birds, religious figures, sun and moon, and "heads." By "heads," I mean they make pots and cups in the shape of men's and women's heads of the various cultures who have lived in Sicily, like the Arabs, Greeks, and Romans. It sounds odd but is really very cool. 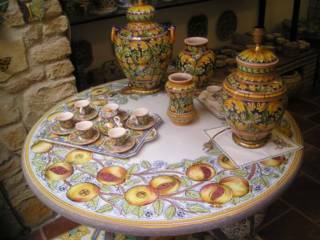 They also make gorgeous ceramic tops on lava rock (there's no lack of that in Sicily), usually with wrought-iron legs. You can special order anything you want. In fact, my principal has a high kitchen table that was hand-painted to match her dishes. I am waiting to get into my place before I start to splurge on these things, but I have plenty of room since I put LOTS in storage upon leaving Germany. My friend Hope had a bit of a misunderstanding with her new landlord due to the English language. His English is limited, but he looked up the word for "go away" and found "leave." So, when they were having a conversation about what he should leave in the house and what to take out, he would say, "I leave it" when he meant "I will make it go away." She, of course, was saying, "No, don't leave it!" The confusion went on for some time until they realized the misunderstanding. We use the word in two opposite ways, don't we? To leave meaning "go away" and leave something meaning "let it stay." Eventually they agreed to use two completely different words. Whew. And we think learning Italian is hard? By the way, I'm starting a month-long intro course next week! Actually, we were ATOP the volcano. Mt Etna, that is, the largest active volcano in Europe. I will be living on the slopes of it soon, in a village where the last lava flow stopped just a few kilometers shy. To reach the top, you must drive up about 2000 meters to the Refugio Sapienza, the location where all excursions to the top originate. It consists of several restaurants, gift shops, the cable car, and ticket office. Groups are taken to the top either by 4-wheel drive buses or a combination of cable car and then bus to the highest point possible. The volcano is 3323 meters high (that's over two miles!). Kendra was put in a bad mood because she had to give up her sandals and rent socks and hiking boots from non-helpful Italians. (The non-helpful is what caused the mood.) The bus ride was about half an hour long but seemed like five hours because it was nothing but bouncing and jouncing and you could just feel your vertebrae crashing together. It seemed there were no shocks or springs on these buses. The road itself was a series of sharp switchbacks through barren wastelands of lava--some sandy and some chunky. Since the explosions of 2002-03 wiped out the road, it has just recently been reopened in its current crude state. Luckily we were smart enough to bring jackets, because it was cold and windy up there, unlike the 90+ degrees down below. Once at the top, we hiked about an hour all told and peered into the two live craters from which the eruptions of 2002-03 came. Both are still smoking and hot. The ground we walked on was very warm, and some small holes were dug for us to feel the 300+ degrees inside. It was eerie and awesome at the same time--like being on the moon. The lava rocks were many different colors, depending on the minerals they contained (i.e. copper, iron, sulpher). 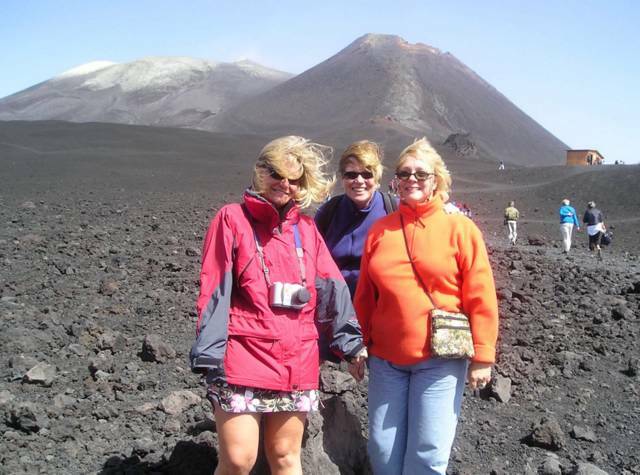 The strong wind blew the lava sand all around, stinging any exposed skin and getting in our hair and on our clothes. Shoes and socks were pretty black by the end of the trek. Our Italian guide made sure to tell us in English what he told the rest of the group. We were lucky to only have to ride the bus partway down the volcano and then catch the gondola (lift), which was much, much smoother and nicer. Pizza and beer were the order of the day when we got to the bottom. I don't know that I feel any safer or less safe about my choice of houses now. Apparently they have lots of warning before any action from the volcano and they can also divert the slow lava flow somewhat. On the other hand, it IS a volcano, and a darn big one. It takes out whatever is in its path, which we could easily see on our ride up and down. Nothing is safe. Taormina is one of the top ten tourist destinations in Sicily, and I think every tourist IN Sicily was there last night! Two friends and I drove up the coast about an hour to get there. The city is perched on top of a mountain and has spectacular views up and down the coast. It's an ancient city with a fantastically preserved Greek theater built into the landscape. Nowadays, people visit for the shopping, the quaintness, the charm, the restaurants, and the views as well as the history. It's not very big and is easy to walk around in. Vehicles are banned from the walking area. We felt lucky to find a parking spot nearby and even luckier to find a wonderful restaurant with outdoor seating and a view (not to mention spectacular food). Although it was very crowded, we didn't mind because . . . Hey! We LIVE here! We can come back any time, any day, any season! And I'm sure we'll do that! Although I've already decided on a place to live, I've been seeing lots of other places with my friend and new colleague, Hope. Nearly every day we go out and see houses and apartments. Unfortunately, every time I do this, I have second thoughts about my own choice!! We have seen SO many beautiful places. Although none is perfect, they each have some details to make them desirable: views of Etna and/or the sea, location, a garage, security, marble floors, high ceilings, built-in kitchens, lights, fans, air conditioning, city gas, light, palm tree gardens, fireplace, etc. So, it's always a trade-off. I had to recall my main priorities in order to stop myself from wondering if I made the right choice. Anyway, one really interesting thing is the landlords who show these houses. They make you feel like one of the family! In the past two days, we have been invited to sit down and drink some wine, eat cake, meet grandma or grandpa, and even to have a complete supper! Of course, we have to be polite and take advantage of all of these offers. In Sicily, you are immediately embraced by the family. One little grandmother (noni) yesterday brought out her fresh tortelloni and homemade pasta to show us. Another landlord gave us bottles of homemade wine and a bad of fresh figs from his farm. I'm totally surprised and awed by the friendliness of the Sicilians. Even though they usually speak little to no English, they want to make us feel comfortable and at home with them. Life's Another Beach . . . Yesterday I spent most of the day at a different beach, this time in the ancient Greek town of Naxos. It is Greek in origin, not located in Greece, by the way. It's actually just up the Sicilian coast, again below Taormina. Imagine a glorious, clear blue sky and glorious clear blue water, a light breeze, a sandy beach, sun, and three friends. Then throw in fabulous views in all directions, a sand bar you can walk on 300 yards from the beach, lots of beautiful people, a few crying babies, private canvas chairs (each with their own little awning), umbrellas, tables, vendors, and perfect water temperature. Add in two restaurants on this beach, private restrooms and showers, cold beer, "grattini" (Italian-style homemade "slushies"), rum coolers, and then pizza, pasta, tablecloths and real silverware, more beer, more sun, and maybe a few postcards on the way out. And only 5 Euros for the beach this time. Wow! That's about $6 for the whole day. I wonder if one can rent a "beach apartment" for the summer, like folks did for skiing in the Alps in winter? Hmmmmm. Something to consider. A friend of mine who worked all over Italy told me that the food gets better the further south you go, and I would have to agree. Sicily is the place, and I'm certainly having a good time with the food and drinks. In a restaurant, everything is ordered a la carte, so you can have exactly what you want, whether it's one course or five. Appetizers (antipasto) are the place you start. This can take the form of tomatoes with the real (Bufala) mozzarella cheese drizzled with olive oil and sprinkled with fresh basil. "Bufala" refers to the long-horned cattle near Naples that produce the milk from which this cheese is made. Up on Mt. Etna, mushrooms from the forest are very abundant and popular in all courses, including appetizers. Many places have a "Sicilian antipasto" mixed plate which might include roasted peppers, eggplant, mushrooms, ham, cheese, and olives (all cold). Many people like the melon or fresh pineapple slice with thinly sliced smoked ham (proscuitto). Sometimes there's an antipasto buffet with such substantial things as quiches and spinich lasagna like I experienced earlier this week. In fact, one could make an entire meal from a buffet like that one. How I almost registered my car . . .
Well, I almost registered my car yesterday. Even though it's been inspected, insured, licensed, registered, and approved in Germany, none of that seems to count here. I had to have it re-inspected, show proof of insurance, get an Italian translation of my driver's license, get an appointment, produce all kinds of data I don't really know (i.e. horsepower, current value, size of engine), produce an Italian "soujourner" (I still don't know what that is, but I'm to pick it up at the legal office on Friday), get a copy of my official (red) passport, and pay 45 Euros (more than $50). All of this fun stuff takes place on another base--Naval Air Station II (NAS II), which is a 15-minute cross-country dash. Then, when I get all that together, I will get to drive to the city of Catania (luckily following an Italian from the motor vehicle office) and let Italian customs make sure it's not a stolen car. Finally, if all goes well, they will issue me Italian license plates and I can have them put on and also buy gas coupons. That will be a big plus, as Italian gas is now more than $5 per gallon. Wish me luck on this one. One thing Sicily has plenty of is BEACH! On Sunday, I went to one of the nicest with my principal Marj, assistant principal Connie, Kendra, and Mike. We left early in the morning (for a Sunday it was early) in an attempt to beat some of the beach traffic and get a reasonable parking place--both very challenging. 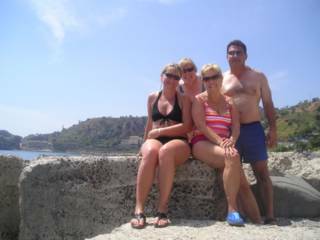 The nicest beaches are between Catania and Messina, especially in the Taormina area. So, our strategy worked and we were there early enough to get great parking and beat the rush. 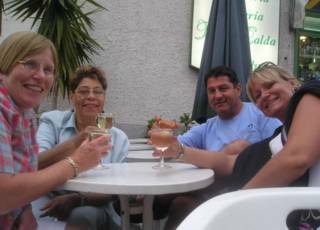 The beach that Marj chose for us is a private one called Lido Caparena and owned by the hotel of the same name. *Very* posh! http://www.vulcanoconsult.it/hotel_caparena_taormina_sea.htm It cost 8 Euros each (about $10) to get in, but that buys the use of a beach chair, umbrella, table, showers, changing rooms, rest rooms, and lifeguards. There is also a wonderful restaurant for lunch or drinks. We settled in our comfy chairs and spent the entire day sunning, dozing in the shade, reading, swimming in the crystal clear cool Mediterranean (actually the Ionian Sea), people watching, talking, and bartering with the vendors for towels, beachwear, jewelry, etc. We wandered up to the restaurant for a lunch unlike any I had ever had at the beach. And, it was reasonable! We enjoyed risotto, seafood salads, grilled tuna, wine, desserts, and Italian coffee. More beach time before washing off the salt and heading home. This should be a regular Sunday event as long as the weather is nice. On Saturday afternoon, Kendra, my sponsor, and Lisa, TAG teacher and Italian speaker, took two other new teachers and me to see three available houses. All three were up the volcano (Mt. Etna) and near each other. House #1: This was the house that the former special ed teacher recommended to me (and recommended me to her landlords). First of all, it is in the cutest Sicilian town I've seen so far, Nicolosi. It's a little touristy town with tons of shops, restaurants, etc., right at the edge of the Etna National Park. Lots of trees, parks, trailheads, and views of Etna. It has a town square and frequent festivals (St. Anthony, at the moment). Then, the house is in a very nice neighborhood that is quiet. The street is unusually wide for Sicily, and there is a view of Etna. The house itself sits back off the street behind two gates. It's a one-story bungalow-type with patios all around. The living-dining room are sunken and have hardwood floors. There's a fireplace in the living room. the kitchen is small but does have built-in appliances and cabinets, not always the case here. Bedrooms are small--one is larger than the other two. There is a bath (with BATHTUB) and a shower in the "mud-laundry"room. There is also a half-bath. No garage, but gated parking. There is an out-building. The yard is very nicely landscaped with lots of trees, shrubs, herbs, etc. No grass to speak of, and I'd need a gardener once a month to take care of things. There is an alarm system that is hooked right into the police station. The landlords don't speak English much at all, but are younger people and very, very nice. Lorie, the former resident, left me a bottle of wine! House #2: Former assistant principal from the elementary school lived here. It's one town down the mountain from Nicolosi. The house itself was actually nicer--very much bigger, although on several levels. The colors (walls, floors, etc.) very soothing, nice colors. We heard the bottom floor isn't heated, but don't know for sure. The entire back yard was a patio--very nice. Unfortunately, it was just a little way off the main road and very noisy (I thought). Also, there seem to be lots of children in the neighborhood, all of whom are playing in the street. House #3: American naval family living in this one. The main features were *security* (they kept describing it as a "fortress" with everything from bullet-proof glass to numerous alarm systems). That kind of scared me. The yard was great. There was a wall all around it and the neighborhood was much dirtier than the other two. It had a lot of possibilities, for not for me. I had already decided on #1! Today (Monday) I went to Housing and told them I wanted it . . . . there is some painting and cleaning to be done, as well as an inspection, so let's see what happens. It's nice to know I have something I like already. I already knew that Sicilians drive "differently" from us. It's a matter of getting into the rhythm and driving like them (but not as badly). And that is pretty much what our instructor told us in 5 hours of class today. While we did cover the official rules of the road, he also said what to ignore and what "the real truth" was. Sigonella Naval Base has the worst driving record of all the military installations in Europe, and it's not even very big (about 4000 drivers?). Last year, there were 751 accidents involving Americans. This year, they are ahead of that record with 370 this year already! If things don't improve immediately, the "Skipper" (i.e. the commander) has threatened a "Cinderella Liberty" for all lower enlisted sailors. That would mean a midnight curfew for ALL of them every day. Anyway, 90% of the accidents involve drivers 25 years old or younger. This has caused a 300% increase in insurance costs for ALL of us this year. Bummer. I know mine will be about $150/month. Did you know that if you hit and kill a sheep in Sicily, you will be fined 100 Euros? If the sheep is pregnant (which they always are), it's 200. Worse, you'll be fined 500 Euros for mowing down an orange tree and 700 for an olive tree! If you get mad and curse a caribinieri (policeman), you'll get a 500 Euro fine, too. Things that make Sicilian driving interesting and different are confusing or non-existant signs, intersections with no visibility, terrible roads, narrow roads (mirrors get torn off), Mt. Etna junk on windshields, lanes that just end randomly, no lines painted on the pavement, yielding customs which vary from town to town, drivers that tailgate, passing in the middle of the road (you should edge over to the side), roads that incline up to 20%, motorbikes and scooters that follow no laws, and stoplights and signs that are optional. In addition, ambulance drivers are just that--drivers; they don't have any medical training. They can just pick you up and take you somewhere or pronounce you dead--it's their call. 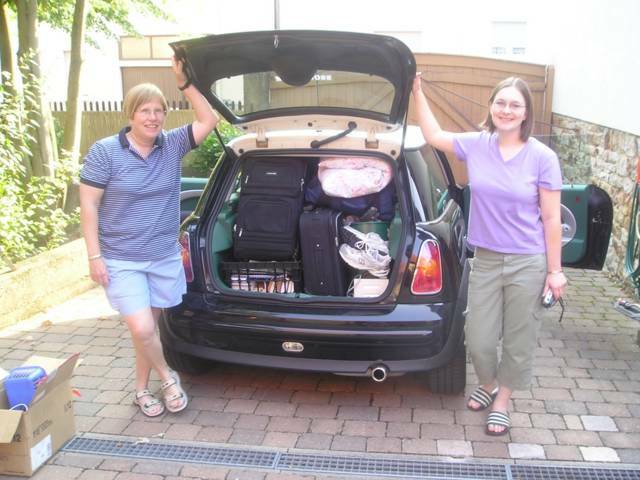 It was unfortunate that Shana had to fly back to Germany the morning after arriving. It made me sad to see her off at the airport in Catania not knowing when I'd see her again or when she would get back to Sicily. She wants to save up a lot of her leave time to take a summer language course next summer. Hopefully, though, she and I can find a way to make another visit happen sooner rather than later. I can't say enough good things about my sponsor, Kendra, who has spent enormous amounts of time and energy helping me get what I need and get the things done that need to be done! She's the ideal person to do this--organized, efficient, energetic, determined, caring, and sensible. She has a great sense of humor and know *everything* to boot! Plus, she can maneuver her SUV through, around, over, and into any Sicilian road, lane, alley, or motorway. It's going to be great to team teach the Integrated World History/Honors English 10 class with her. AND, our rooms are right across the hall from each other. So, on the first full day there, I registered in Housing (there are places available and appointments were made), met with the principal and assistant, drove to NAS II (the other part of Sigonella base) to temporarily register my car and make another appointment, worked on my BLOG , saw several houses currently occupied by various teachers, helped Kendra move a carful of things to her new house, and had yet another Italian dinner up in Nicolosi (perhaps my future home). This little town is about the cutest I've seen in Sicily. No kidding! I didn't get home till after midnight, but WHAT a good day. On Wednesday morning, Shana and I had to pool our cash (57 Euros) to pay the hotel bill, as their credit card machine was not working. That left us with just coins, but we felt sure we would find an ATM almost immediately along the autostrada. NOT!!! We tried many rest stops, but none had an ATM. Eventually, the highway left the biggest mountains and came close enough for us to get our first real view of THE SEA~^~^~^~^!! The gorgeous blue water was spectacular, especially from our view up on the cliffs above the coast. We drove the last bit of autostrada into the "toe" of Italy and then took a tiny two-lane, winding highway into the port city of Villa San Giovanni where we would get the ferry to Sicily. STILL no money in hand. We knew we would need it to purchase the ferry ticket but a bank was not to be found anywhere. I thought perhaps they would take a credit card, but they would not. Finally, a bank and ATM were found across the street from the ferry landing and all was well. The ticket was 21 Euros (one-way) for the car and us. 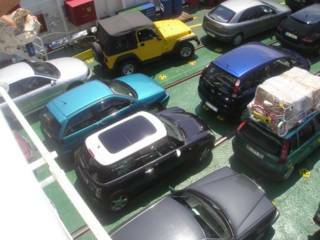 We drove into the hull of the huge ferry along with about a hundred other cars and trucks and departed from Italy's mainland for the island of Sicily and the port of Messina. Sicily was so close, the trip only took about 45 minutes. And, the scenery on both sides was spectacular with the blue Mediterranean, the whitewashed cliffs, palm trees, and towns and houses clinging to hills. They have been talking of building a bridge between the two for years, apparently, and it looks like it would not be that difficult. The city of Messina, in the northeast corner of Sicily, looks like a great place for some exploring later on. We hopped onto the autostrada and quickly drove down the coast to Catania. Shana enjoyed the scenery along the whole way. I hope she gets to come back for a long visit sometime soon. I made contact with Marj, my new principal; Connie, my new assistant principal; and Kendra, my sponsor during the drive. We made plans for dinner that evening. We found the Sigonella naval base easily, got Shana an installation pass, and checked into the Naval Lodge. It took several trips with the luggage cart to empty out my car, but eventually it was all stored in my room (a nice room with AC, kitchenette, TV, etc.). I was quite surprised to see the entire base rebuilt! I guess it has been about 5-6 years since I was last here. It is nearly ALL new and looks like a plush college campus! That evening, we joined Marj, Connie, and Mike, a new teacher, for yet another wonderful Italian dinner at the Golf Club. We dined outside and all had delicious dishes to share as well as lots of wine. It felt very good indeed to be in Sicily at last. We had a cool drink before leaving and decided to drive down the highway and find a place when it began to get dark. With so many hotels around us, that seemed like an easy prospect. However, the landscape became more mountainous, rugged, and wild. We hardly saw any towns, but just forests and valleys miles below us. We seemed to be driving along the cliffs. Eventually is was near dark and we ventured off the highway at the exit for the town of Lauria. We began to go down, down, down a two-lane highway that supposedly led to the town we couldn't even see yet. It seemed like 15 miles, but it was only five in reality. When we got there, it was a one-road town with switchbacks. We had seen a sign for a "Hotel Rosa" but couldn't find it. Being females, we did not mind asking for directions, so we pulled into the only gas station we saw and they immediately directed us to it, just around the corner really. It was a more of a "Ma and Pa" establishment, and the woman did not speak any English. But, we managed to get a room (and then a quieter room) and directions for supper. We enjoyed a fabulous dinner for two at the cost of only 20 Euros total and turned in for the night. We felt that we had fallen into "The Land before Time" but fell quickly to sleep in the cool night. Monday morning was sunny and heated up quickly. We had a great breakfast at the Viest, used my one and only 20 liters of Italian gas coupon (Thanks, MB!) 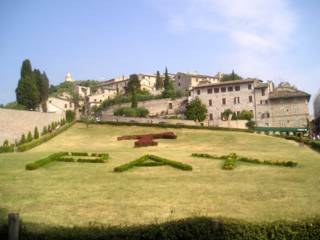 and drove on the autostrada past Padua, Bologna, and Florence on to the small, beautiful town of Assisi. We only traveled 250 miles or so, but it was more heavy traffic and lots of tolls. 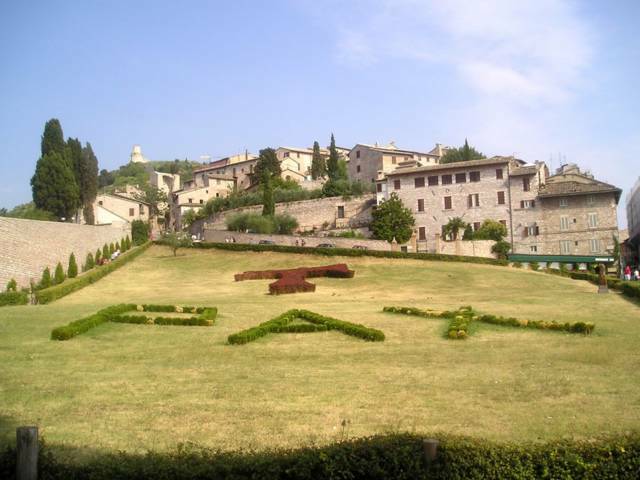 Assisi is about 30 miles off the beaten path, but in the direction of Rome. We got there mid-afternoon and spent about five hours exploring this wonderful place. We saw the Temple of Minerva, the graves of St. Francis and St. Clare, the fabulous Giotto frescoes in the Francis Church, and walked all over the town (which is up and down and cobblestoned, by the way). It was so beautiful, we didn't want to leave, so we found a little country hotel outside of the town just a bit and, after ensuring that they had air conditioning and a restaurant, checked in and enjoyed a shower, AC, and a great meal. They didn't speak much English there, but all was well. We ate very well once again and fell fast asleep. The hotel was called the Hotel Campiglione and the letters "HC" were everywhere. This was a sign for Alison (Holy Cross!). Of course, we took photos. "Peace and goodwill" is a St Francis saying that we found in every language on every kind of souvenir. We liked that. On past Rome & Naples tomorrow. Sunday, the day we left was both frustrating and successful--frustrating because the heavy traffic and jams (Staus, in German) held us up in Germany but successful because we did cover 520 miles and get to Vicenza, Italy for the night. Most Europeans take extended vacations, and many of them take place in August. So, the Autobahns were just jammed with too many cars. Near Augsburg, Germany, it came to almost a full halt on the roadway. We pulled off and had lunch but it was still stalled (for 10 km, the radio said) when we left, so we left the Autobahn and headed south on a two-lane national highway that quickly took us to Munich and around the south side of it, then on to the area of Bavaria where I lived for the past two years. We stopped for a last tankful of gas and an Austrian Autobahn sticker (toll) at the border in the town of Brannenburg, where I rode my bike many times. We then flew through the Inn Valley to Innsbruck in less than an hour and headed up into the Alps, stopping at the world's highest McDonald's with the most gorgeous view you could ever imagine--a panorama of the Alps. We proceeded on through the Brenner Pass (another toll) and then through the highest Alps and into Italy. It was already 6 PM by the time we got to Bolzano, so seeing the Ice Man was not possible. We pushed on to Vicenza and arrived there by 8 PM. After checking into the Viest Motel (my favorite), we had a wonderful, well-deserved supper at a small restaurant with superb food and service (Due Torri)--pasta (first plate), scallopini, vegetables, wine (for me), and fresh berries in wine for dessert. Mmmmm. We also got the scoop on the new no smoking laws in restaurants in Italy, which totally amazes me. How can they be ahead of Germany? However, they are and they are taking it seriously. What a surprise and pleasure. If they want to have smoking, it must be in a totally separated room with lots of ventilation. Most are not willing to pay the price to provide that, so customers run outside between courses to smoke! It was a little amusing to watch them dart in and out of the place. It's a cool, clear morning here in Malschenberg, Germany, with just a few whispy clouds in the sky. It was great to have some responses to my first entry already this morning. Thanks, friends! Shana got in late, so I'll let her sleep a bit. I'm surprised the six o'clock church bells that seemed to ring forever didn't wake her. Coffee, lots of coffee, breakfast, then pack the car and ease on down the road. Gulp.